Some information should not be shared. It’s not because they are not worthy to be shared, but for the majority to be safe and ensure security in the company. An employee must know when to divulge important information and when to keep silent. Companies have a very strict protocol when it comes to that. 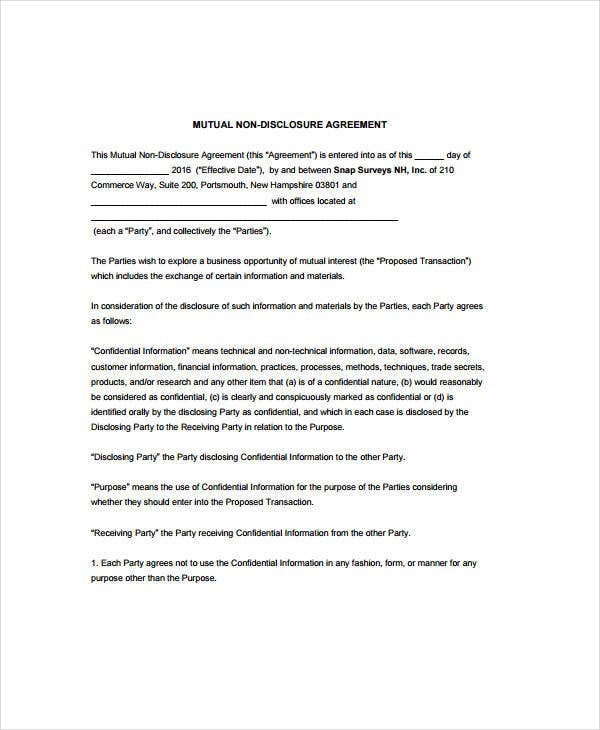 A mutual non-disclosure agreement (NDA) is signed by companies and their business partners to ensure that both parties keep silent about everything that goes on in the business. All duties, responsibilities, and measurements of violations are written in the contract should any dispute occur. This also makes sure that information is handled properly. 1. Identify the parties joining in the agreement. 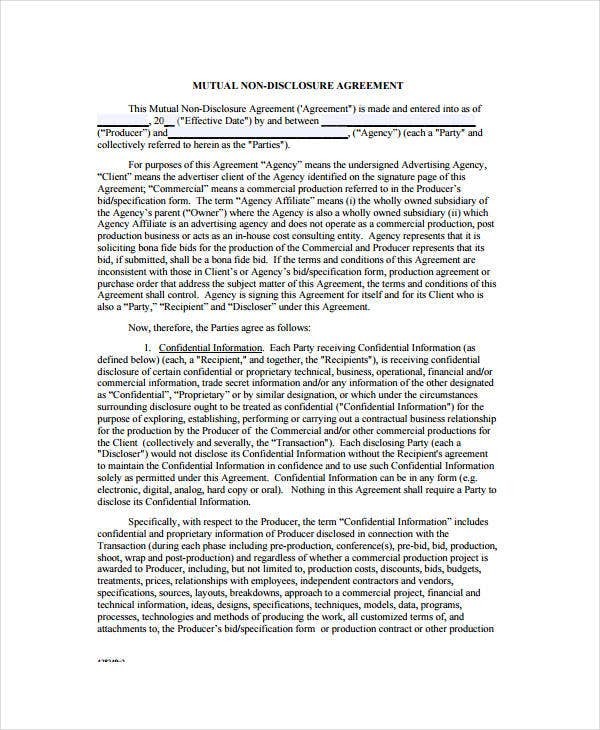 Put the names of the people and their designation who are joining in the sample agreement. Legal names of the companies must be included as well. The categories of the employees in the company joining the agreement may be included along with the company name if the agreement is still subject to change. 2. Establish the agreement’s purpose. 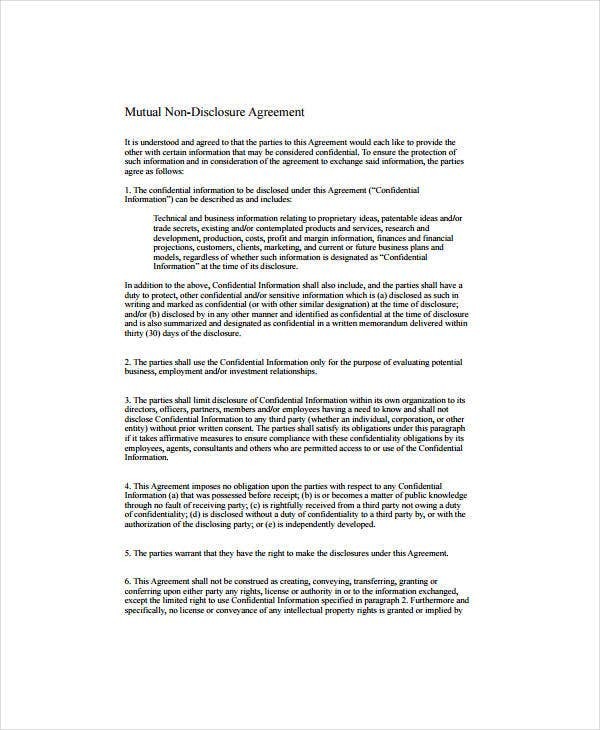 You have to state the reason for such agreement in the document. Every agreement is not agreed on without any reason. You also have to state the smart goals that you want to accomplish through the agreement. 3. Define the confidential and non-confidential information. There has to be a clear definition and borderline between the confidential and non-confidential information. Information such as strategies, prototypes and important documents should be protected at all times. Legal requirements also fall under the category of confidential information. Since the agreement is mutual, it should also be stated that secrets regarding the business can be shared with each other. No one must keep anything from the other party. 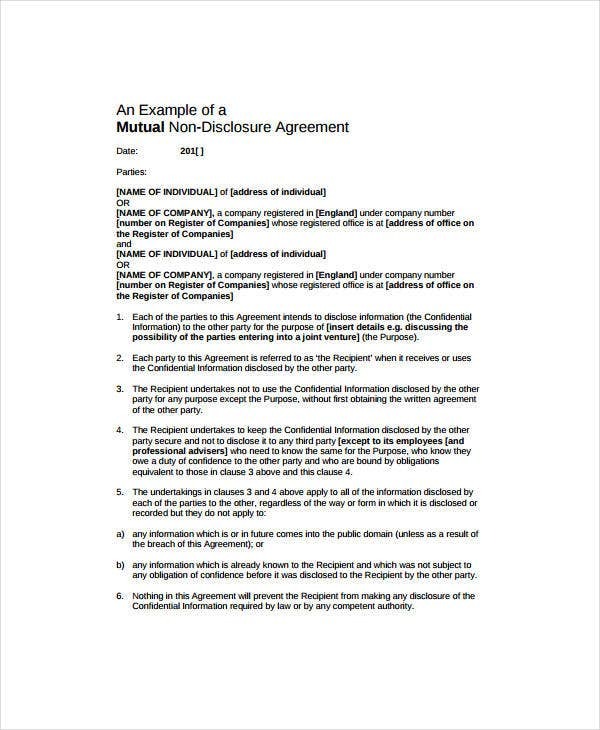 Other non-confidential information must be stated in the agreement as well. You may also see free non-disclosure agreement forms. 4. Describe the duties of both parties. When receiving confidential information, both parties must know what to do. It should be stated in the agreement. Create a list of a protocol on what each of you should do in receiving information. For example, the information must only be discussed through emails for security. Another option for the duties is that the information should only be used for the project that both of you are working on. Measures must also be taken once the information is at risk, or when there is no written agreement in this part at all. Put a time frame for the validity of the contract. Write the start and ending date of it so both of you would know how long it is good for. The validity of the agreement can start as soon as it is signed. Within that span of time, both of you are expected to carry out your duties and responsibilities well. You may also see non-disclosure agreements. 6. State penalties for breach. 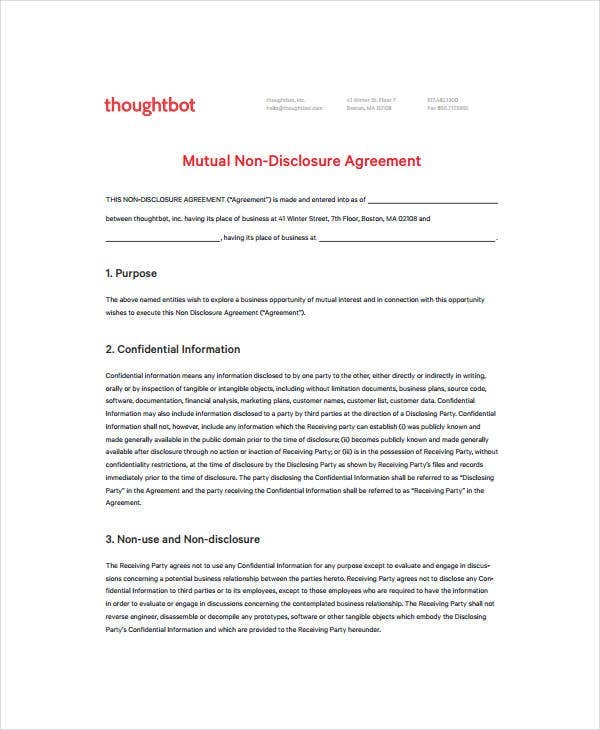 The mutual non-disclosure agreement can be breached as with other agreements. Include monetary penalties for the breach of an agreement. When the disclosure is intentional rather than accidental, the company will be made to pay double to triple the original amount of the damage. 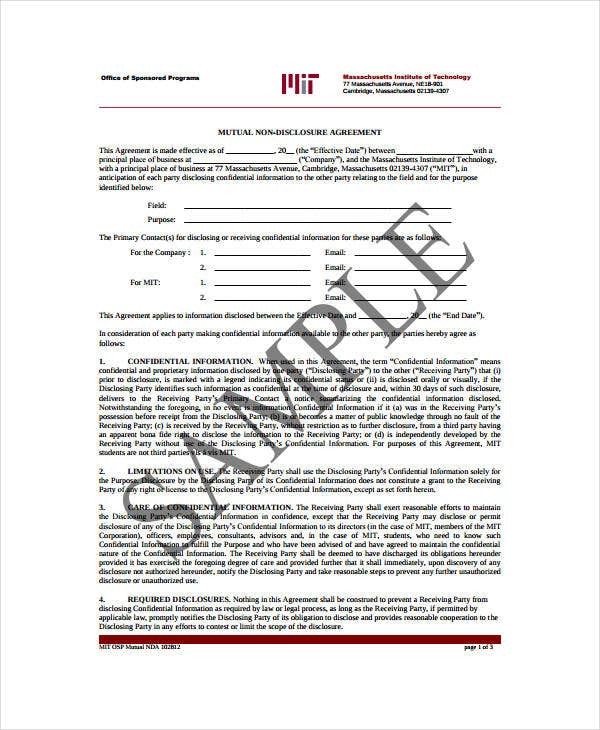 You may also see non-disclosure and confidentiality agreement templates. A series of steps will be done once the agreement is breached. You can even take it to court and sue the breaching party for damages. When that happens, he is not allowed to use the information outside the bounds of the agreement. He also has to pay for the damages caused by his reckless actions. 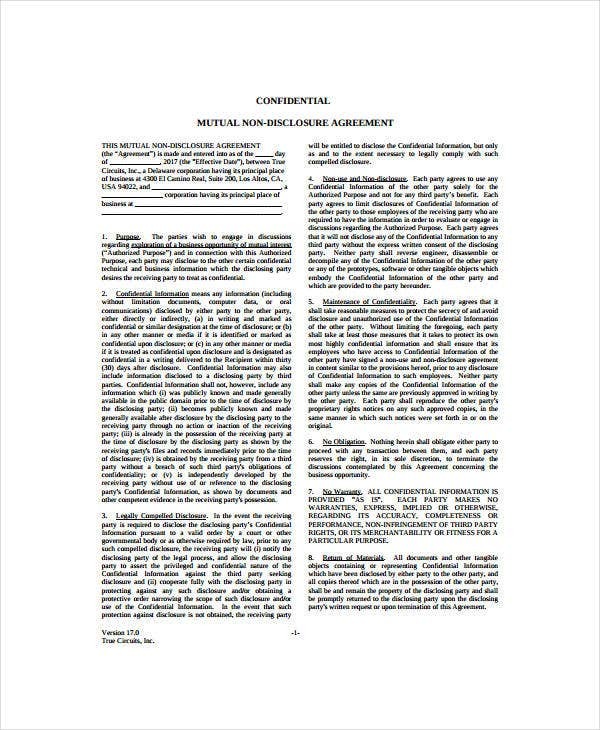 You may also see word non-disclosure agreement templates. After reading and understanding everything that is written in the document, put in your signature to certify the validity of your document. Leave an ample for signature in your document to make the signing easier. 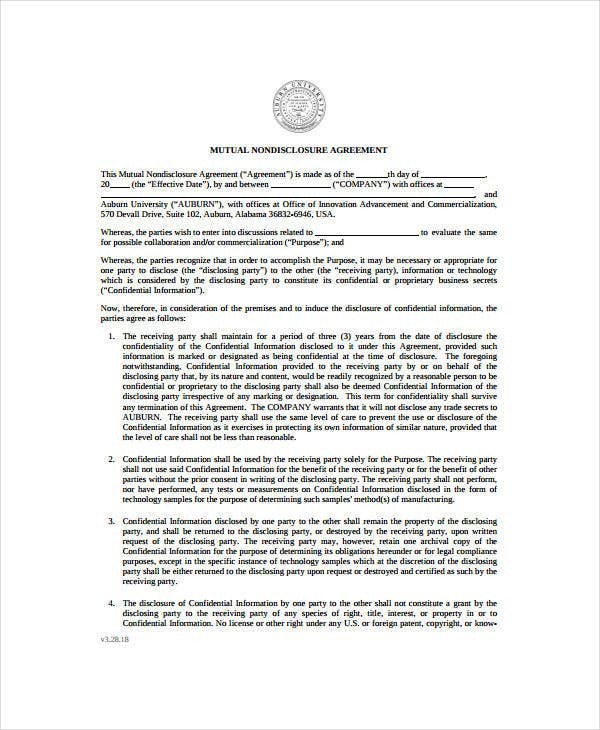 You may also see standard non-disclosure agreement forms. This happens when the other party does not get what is agreed on in this agreement. For example, when the agreement states that he would be given a job once he signs the document. In the end, he does not get a job. That can be a good ground for him to terminate the agreement. You may also see sample non-disclosure non-compete agreements. When the agreement favors only one party and makes the other suffer, it is more than just valid to end it. The oppression of the agreement can take a toll on the suffering party’s physical and mental health. It can also drain him financially. In business contracts, a consideration is a material value that both parties must give up so the contract can be valid. It is mutual when both of you keep some confidential information. When one party is giving work to the other, it is also called a consideration. When this part does not exist in the agreement, get out of it as early as you can. You may also see non-disclosure and confidentiality agreements. Some companies make their employees sign a mutual NDA so they won’t disclose information for a given period of time. A part of the agreement states that you are not allowed to work in the same industry. For example, you work for a graphic design company and you sign an NDA stating that you can’t disclose any confidential information for 5 years. When your contract after 3 years, you are prevented from getting another job related to graphic design. You can always take this to the court as the company is being anti-competitive with their labor practices. 5. When the breach happens. There’s nothing much to comply when the other party breaches the agreement. It is more serious on his side since he will pay for the damages brought about by his actions. On your side, all you can do is have some paperwork settled and wait for the hearings to start. You may also see confidentiality disclosure agreements. Some shady things can happen while the agreement is going on. When you are caught in any of it, you have to learn how to protect yourself. Always consult a lawyer before signing the agreement. He can tell you what to do and help you decide better. However, if you are already in the middle of the agreement, you still need his help every now and then. If you are caught in a situation that does not give you any favor, ask a lawyer for help on what to do. 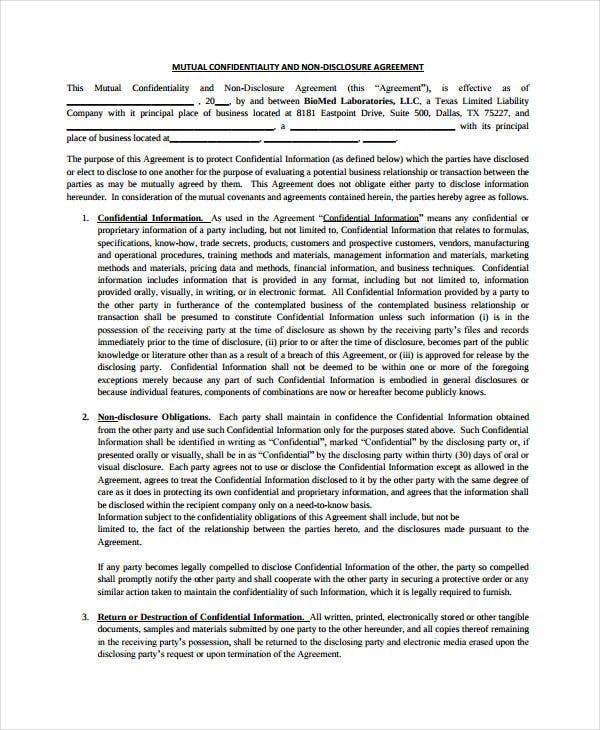 You may also see confidentiality agreement templates. Before you strike back to the party who breached the contract, gather up your evidence and facts. You would be questioned as to why you are planning to terminate the agreement. Get a copy of financial records and the irregularities done by the other party. Screenshots serve a very large purpose in this kind of dispute. They provide strong evidence and can topple the other party’s reputation. You may also see non-disclosure agreement samples. In case of being sued for breach of contract, read the complaint and check if there are incorrect facts. This can help you in making a cohesive and strong counterattack to the lawsuit. Get a lawyer to help you in your defense. You may also see simple non-disclosure agreements. In mutual NDAs, a termination clause is always included. This details how both of you can terminate the agreement. Read this part well and take note of the steps that you can do. One part of it states that you must still not disclose the confidential information shared to you prior to the termination of the agreement. You can also ask the other party to terminate the agreement. When he agrees, both of you should draft a cancellation and release agreement. This agreement will tell you what to do and what things to settle once the prior agreement ends. You may also see volunteer confidentiality agreements. It is a basic human rule to not share anything confidential to other people. With this agreement, trust is a great foundation that should be invested in. Before getting into this kind of agreement, make sure you know the person you are doing business transactions with very well. You may also see basic confidentiality agreements.